is available on DVD, Digital & Broadcast TV! Kutsher's Country Club was the last surviving Jewish resort in the Catskills. One of the legendary Borscht Belt hotels during its heyday, Kutsher's was family-owned and operated for over 100 years. Exploring the full Dirty Dancing-era Catskills experience through a close up look at Kutsher's rise and fall, this award-winning documentary captures a last glimpse of a lost world as it disappears before our eyes. The Catskills resorts were not only a Jewish refuge and family vacation paradise, they also gave birth to American stand-up comedy, an NBA All-Star tradition, and all-inclusive resorts. This film brings to life how Kutsher’s thrived at the center of all this growth and excitement. Watch Wilt Chamberlain both playing ball and working as a bellhop at Kutsher’s; Red Auerbach as the Kutsher’s Sports Director; and Kutsher’s Maurice Stokes benefit game create an All-Star basketball tradition. Laugh with appreciation at Freddie Roman as his classic Borscht Belt routine still brings down the house, and wonder in amazement as Andy Kaufman wrestles a female Kutsher’s guest for $50. Marvel at the abundance of hearty kosher feasts where no one can get away with ordering just one main dish, and the non-stop whirl of recreational activities. 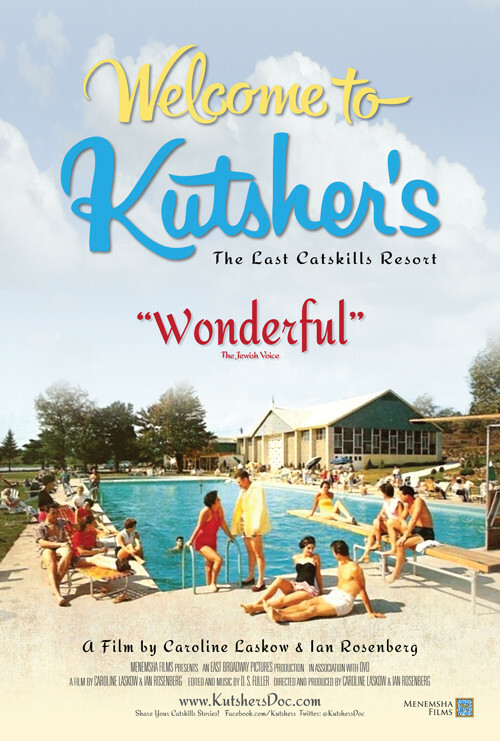 And as the Catskills decline, this film provides unprecedented eye-witness documentation of Kutsher's from its 100th anniversary season through the next seven years until the hotel is sold and demolished in 2014. The story of Kutsher’s is uniquely American, unexpectedly moving and a vital chapter – previously unexplored – of the modern Jewish experience. DVD & Digital Release: on Amazon, iTunes, GooglePlay & more. "Amazing. Not only will the film transport you back to the glory days of your youth and thousands of memories, but it will also make you long for a world that is now lost forever. Do not miss this film." "Lovingly lays out the history of the Borscht Belt vacation with a grand smorgasbord of history, photos and film footage, and an appropriate dollop of nostalgic schmaltz." "The joy of Welcome to Kutsher’s is that it captures what was unique and special about the hotel while also expounding on the larger significance of the Catskills in the American Jewish consciousness." + Read more great press (from ABC News, The Wall Street Journal, NPR and more) here. for Welcome to Kutsher's updates, click here.